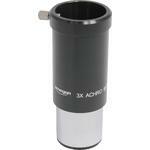 This reducer halves the focal length of your telescope, giving you a much wider field of view. 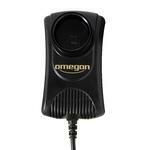 You can use this, for example, for doing astrophotography using an astronomy webcam. Using the reducer is ingeniously simple - it is threaded for attaching to a 1.25" filter thread, which lets you easily screw it into any 1.25" eyepiece or 1.25" camera adapter. 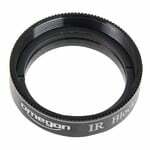 Screw the Omegon reducer into the filter thread on your camera and so double the size of the photographic image field. This lets you take images of much larger areas of the lunar surface, for example. The reducer is also great for taking videos of the Moon using your webcam. You can obtain even larger image fields with your astronomy webcam if you attach an extension tube (e.g. 25mm) between the reducer and camera. Screw the reducer into a 1.25" eyepiece and you have a smaller magnification and hence a significantly larger field of view. 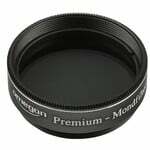 You can use the reducer if you don't have the correct eyepiece. The reducer is optimal for achieving a focal length of up to about 25mm. The reducer is useful for 0.25 to 0.5 inch chips (webcams, DMK, Watec) and focal ratios from f8 (refractors, Maksutov and SCs). It needs about 5cm of back focus. The result an f4 to f6 optical system. The reducing effect can varied by using the distance from the chip, e.g. by filter rings. The reducer is unsuitable for DSLRs and large CCD cameras as the chips are not completely illuminated. Connector (at camera end) 1,25"
Tested with the Skywatcher Maksutov 102/1300 telescope. 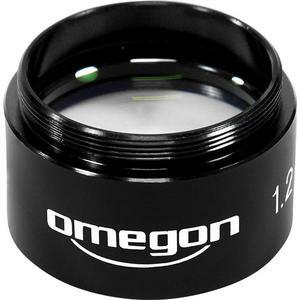 This lens is expected to work for most amateur telescopes, screwed into the back of a common 1.25" barrel and of any common eyepiece or CMOS camera. Unfortunately this is not the case, at least certainly not for the SkyWatcher Maksutov 102/1300. 1) Diagonal. Certainly this is not what the Product Description advises, but is recommended in some websites. Forget it: for this lens and a small telescope this just does not work, being impossible to focus the image. 2) Skywatcher MA 25mm eyepiece. Excellent result: this lens appears to be geared towards extending the AFOV of a wide-angle eyepiece, and does this very well. It has to be said however that if this is the only way it will be used, a similar result can be achieved with a separate 40mm eyepiece of similar quality. 3) Skywatcher MA 10mm eyepiece. Serious loss of sharpness. 4) Explore Scientific Ar 9mm: very good result, yielding something like a 16mm with a fair quality. 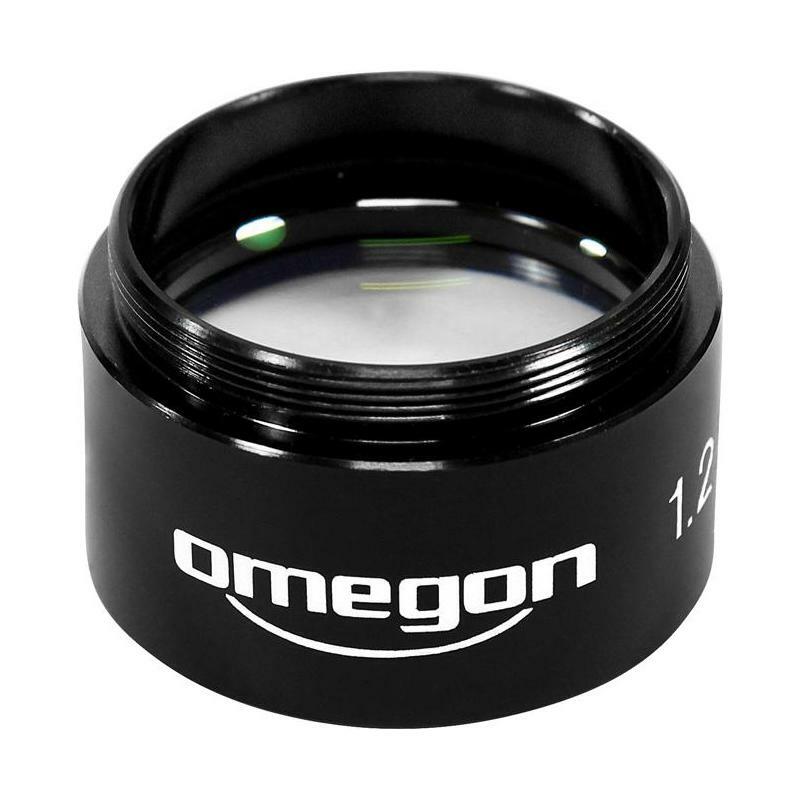 However, the much-lower-cost alternative of the Skywatcher MA 25mm eyepiece inserted into an Omegon Barlow 2X yields the equivalent of the similar 12.5mm with better image quality. 5) CMOS Camera: good image quality, but limited to the centre region of the picture (not more than about 700x500 of the total 1280x1024), with significant coma elsewhere blurring everything. I tried different diagonals, screwing the Focal Reducer to different extents, meddling with the focus, to no avail. My conclusion: at least when in use with this telescope or similar ones, this Focal Reducer appears to deliver poor results with a CMOS camera and short-focal eyepieces. Its only use is to widen the AFOV of a 25mm or similarly-long-focal eyepiece.